Block the formation of the DNA building blocks, deoxyribonucleotides: guanine, adenine, cytosine, thymine. Inhibit mitotic spindles functions required to separate chromosomes during mitosis. AN AA binds to DNA bases (guanine, adenine, cytosine) altering the configuration of the DNA strand. The intracellular enzymes that normally repair DNA errors are stabilized at the alkyl molecule causing fragmentation of the DNA strand. AN AA binds to DNA bases creating a cross link that prohibits strand separation required for DNA synthesis or transcription. Mechlorethamine - results in DNA base pair mismatching, DNA interstrand crosslinking, the inhibition of DNA repair and synthesis, cell-cycle arrest, and apoptosis. Chlorambucil alkylates and cross-links DNA during all phases of the cell cycle, resulting in disruption of DNA function, cell cycle arrest, and apoptosis. Melphalan alkylates DNA at the N7 position of guanine and induces DNA inter-strand cross-linkages, resulting in the inhibition of DNA and RNA synthesis and cytotoxicity against both dividing and non-dividing tumor cells. Ifosfamide is a prodrug activated in the liver. It alkylates and forms DNA crosslinks, thereby preventing DNA strand separation and DNA replication. Busulfan inhibits DNA replication and RNA transcription by DNA alkylation and DNA breaks. Altretamine may produce reactive intermediates which covalently bind to DNA, resulting in DNA damage. Procarbazine inhibits protein and DNA synthesis. It may also undergo auto-oxidation, resulting in the formation of cytotoxic free radicals which damage DNA through an alkylation reaction. Dacarbazine alkylates and cross-links DNA during all phases of the cell cycle, resulting in disruption of DNA function, cell cycle arrest, and apoptosis. Temozolomide cytotoxicity primarily due to methylation of DNA which alters expression of genes during division, resulting in inhibition of DNA replication. Nitrosureas: Can cross the blood brain barrier. Form free redicals. Carmustine alkylates and cross-links DNA during all phases of the cell cycle, resulting in disruption of DNA function, cell cycle arrest, and apoptosis. Streptozocin alkylates DNA, forming inter-strand DNA cross-links and inhibiting DNA synthesis. Due to its glucose moiety, this agent is readily taken up by pancreatic beta cells, inducing diabetes mellitus at high concentrations. Unlike other nitrosoureas, streptozocin causes little myelosuppression. 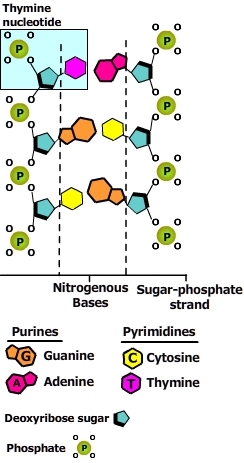 Cisplatin forms highly reactive, charged, platinum complexes which induce intrastrand and interstrand DNA cross-links, as well as DNA-protein cross-links. Oxaliplatin forms both inter- and intra-strand platinum-DNA crosslinks, which result in inhibition of DNA replication and transcription and cell-cycle nonspecific cytotoxicity. Topoisomerase I inhibitors - Irinotecan and topotecan bind Topoisomerase (I) to DNA which leads to a DNA strand break. Normally topoisomerase relaxes the DNA supercoil by clips one strand of the DNA double helix which allows the helix to unwind a bit, then it re-attaches the cut ends. Relaxing a section of the DNA facilitates replication and transcription. These drugs inhibit the re-attachment process. Epipodophyllotoxins - Teniposide and etopiside poison Topoisomerase (II). Topoisomerase (II) relaxes the DNA supercoil. It clips both strands of the DNA double helix which allows the helix to unwind, then it re-attaches the cut ends of both strands. Relaxing a section of DNA facilitates replication and transcription. Poisoning of topoisomerase II causes cytotoxic double stranded DNA breaks. Taxanes - docetaxel and pacilitaxel stabilize the tubulin molecule within microtubules. Microtubules are dynamic structures that support cell shape, motion and form the mitotic spindle. Taxanes stop mitosis by preventing the shortening of mitotic spindle necessary to move the chromosomes to opposite poles of the cell. They are also believed to inhibit cell migration and angiogenesis. Vinca alkaloids - vinblastine, vincristine and vinorelbine cause disassembly of microtubes, blocking mitotic progression, resulting in cell death by apoptosis. Epirubicin hydrochloride - an anthracycline salt, intercalates into DNA and interacts with topoisomerase II, thereby inhibiting DNA replication and repair as well as RNA and protein synthesis. This agent also produces toxic free-radical intermediates and interacts with cell membrane lipids causing lipid peroxidation. Mitomycin - bioactivation results in an alkylating agent that forms cross links that inhibit DNA synthesis. Antimetabolites are biochemical imposters that compete with the physiologic molecules necessary for normal cell function and replication. They often act by damaging DNA or impeding normal DNA synthesis or transcription. Methotrexate inhibits enzymes necessary to synthesize the purine and thymine bases. Pemetrexed inhibits similar folate enzymes and has been approved for use in combination with cisplatin. Purine analogs are chemical substitutes for the purine bases guanine and adenine which are required for the normal synthesis of DNA or RNA. Mercaptopurine is metabolized to 6-thioguanosine monophosphate (6-thioGMP). Accumulation of 6-thioGMP can inhibit the syynthesis of the natural guanine nucleotide. When 6-thioGMP undergoes additional phosphorylation to 6-thioguanosine triphosphate, it can displace the normal guanine nucleotide during DNA synthesis leading to cytotoxic mutations. Azathioprine is a prodrug that is converted in vivo to mercaptopurine. Fludarabine is a fluorinated adenine molecule whose metabolite inhibits several vital enzymes causing the discontinuation of the synthesis of normal DNA and RNA. Thioguanine is a sulfur analog of guanine that is converted to 6-thioguanilyic acid (TGMP). The monophospahte TGMP inhibits the synthesis of purine nucleotides required for DNA sysnthesis. TGMP can displace the normal guanine nucleotide during DNA synthesis leading to cytotoxic mutations. Pentostatin binds to and inhibits adenine deaminase (ADA), an enzyme essential to purine metabolism. Inhibition of ADA appears to result in elevated intracellular levels of deoxyadenosine triphosphate (dATP) which may block DNA synthesis through the inhibition of ribonucleotide reductase. Capecitabine is an oral prodrug that is converted to flurouracil within the cell by a series of enzymatic reactions. Thymidine phosphorylase is one of those enzymes. Thymidine phosphorylase is often overexpressed in tumor cells. Over expression of thymidine phosphorylase by tumor cells results in higher levels of intracellular 5-FU then healthy cells. Floxuridine is rapidly converted to deoxyuridine mono-phosphate, a potent inhibitor of cell growth. However, flloxuridine is not widely used because deoxyuridine mono-phosphate is rapidly metabolized to flurouracil. Cytarabine metabolite Cytosine arabinoside is incorporated into the DNA by polymerase afterwhich elongation of the chain is stopped causing fragmentation and abnormal ligations. Gemcitabine is converted to the nucleotides difluorodeoxycytidine diphosphate and difluorodeoxycytidine triphosphate. Difluorodeoxycytidine diphosphate inhibits ribonucleoside reductase which is the enzyme that catalyses the formation of deoxyribonucleotides from ribonucleotides. Thus, the ribonucleotides ADP, GDP and CDP are not reduced to form the deoxyribonucleotides dADP, dGDP, dCDP required for the synthesize DNA.